My first BuzzBox arrived. In my last post I explained what Buzzer does and what it entails to be a Buzzer and to Buzz. I had already read some reviews and saw some “unboxing vids” online; many of the 2000 Dutch Buzzers seem to be dissapointed with the contents of the box, I’m 1 of the 10 Buzzers that got the box for free, so I’m just curious. I got an email I was supposed to receive the box on Saturday, but since I was still roadtripping, I expected a note in the mailbox that the BuzzBox had been delivered at the postoffice or at my neighbours’. It wasn’t. Thanks to the “Track and Trace code” I figured out the box would be delivered on Wednesday, but suddenly the doorbell rang on Tuesday and there was the mailman to deliver my box. Meet Mala. 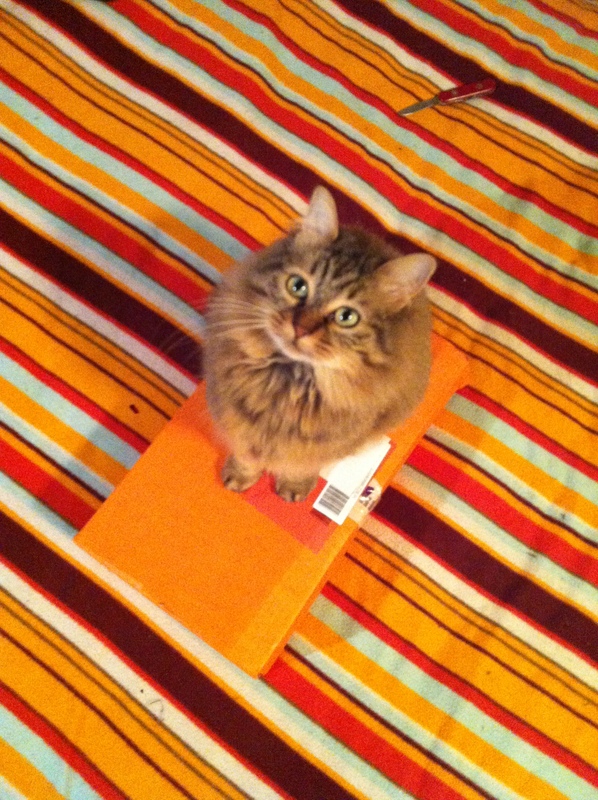 She loves boxes, so she’s my unboxing-assistant. 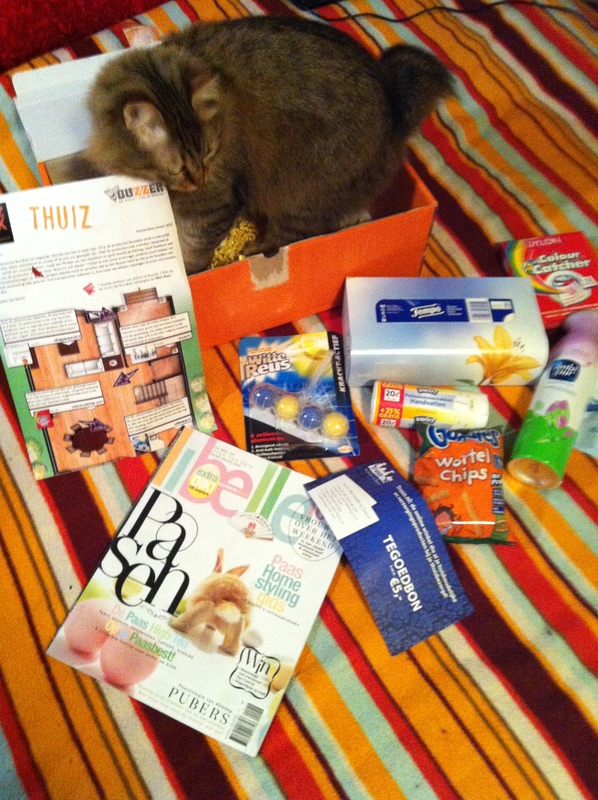 Every BuzzBox has a theme, the theme of this box is “Thuiz“, which refers to the Dutch word “thuis“, which means home. The box contains a letter with explanation of the contents and the marketprices of the products. One of the products written on the letter; acces to afaspersonal, an online expenditure- or housekeeping- book (in Dutch), is not to be found in my BuzzBox. According to the letter this item is worth €2,50,- , but when checking the website it says this service is free? -1 for Buzzer! a € 5,- voucher for www.truus.nl, an online (Dutch) drugstore where you can order household- and caring- products. I have to register to the site first to see if the voucher works. Colourcatcher from Dylon, a cloth that enables you to mix white and coloured laundry in one wash-don’t know yet with which clothes I’m going to test this..
A toiletcleaner- “thingy” from Wittereus which can be hung in the toilet. It’s supposed to clean the toilet, protect it from getting dirty, prevent limescale and give freshness. This is actually the smell Mala didn’t like. Biological carrot chips from Organix Goodies made of solely natural ingredients, developed for small children (from 12 months), and with a “No junk promise”. Mala got a small bite and she totally loved it! I’m eating it as I write this, it tastes sweet, far away you taste the carrot. Because it looks and feels like chips, I do feel like it needs salt. But if it’s as natural as it’s written on the package, I could get used to it and so could your kids. I’m looking very much forward to trying more products from this brand! Garbagebags with handles from Swirl. Handy & hygenic! An Air effects air refresher from Ambi Pur which is supposed to take smells away instead of masking them. Smells nice! I’d use it for the toilet instead of the house, it smells waaay better than the toilet refresher Mala disliked so much. New PH-neutral moist toiletpaper from Edet. Good to have in the house too, especially with this packaging that can be stuck to the wall. If it stays on the wall and doesn’t fall down. Seems to stick for now. Tissues from Tempo. One can never have enough tissues in the house. I just wonder if there’s anything else new about this product besides the package? A copy of Dutch womens magazine Libelle. Some Buzzers complained online that they are male and don’t want to read a womans magazine. Why not? I love mens magazines and I know men that read womens magazines too. Other Buzzers complained that the magazine was old (it’s from March 30- April 05), I like it ’cause I never read it so for me it’s a new one. Mala doesn’t like the smell of the BuzzBox. She thinks it smells like toilet. Human toilet. She also doesn’t like the Easter decoration of the box. She loves the organic chips though and if it would have contained un-natural flavourings or any other additives, I would not have let her try a piece. She likes the looks of the box. She usually spends a lot of time IN boxes (she even fits into a cornflakes box), but because of the smell, she got out of the box as soon as she got in. I’m pretty content with the contents 🙂 Besides the Libelle and Tempo tissues I actually never tried any of these products before yet, although they are already available in the store. The tissues I know they’re strong and soft, I just hadn’t seen this package before yet. I’m a Buzzer baby & I find it pretty cool to be a Buzzer! P.S. 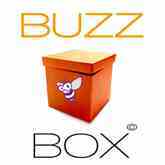 : Since all Dutch Buzzers buzz in Dutch, I asked Buzzer permission to buzz in English, since my blog is in English too and I think also the non-Dutch-speaking consumer in The Netherlands should know what Buzzer and their buzzers do. 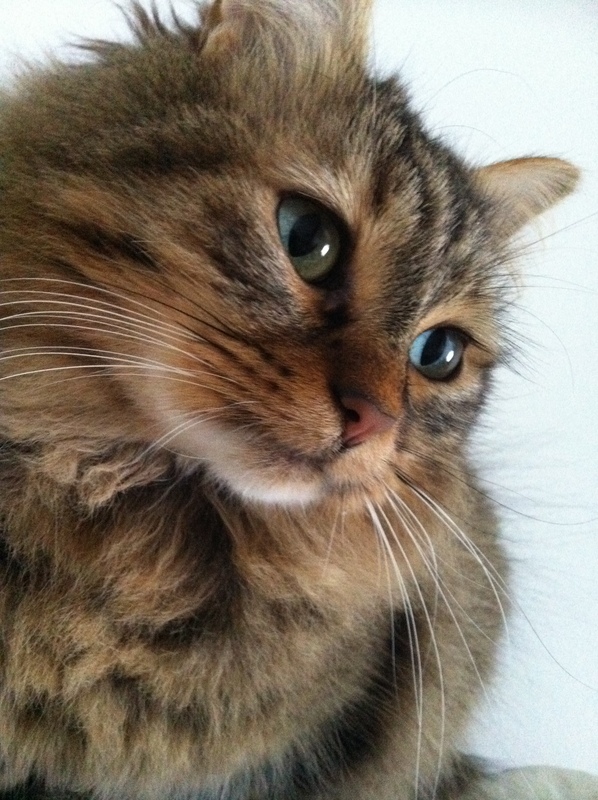 Your Mala is a beautiful cat. The top picture makes me want to kiss her! 🙂 She’d kiss you back!